The crisp masala dosa was my favourite here, and gave me food dreams for days to follow. This place doesn't seem promising from its facade and old school decor, however that's the only reason you can trust the food is going to be epic. The staff seems loyal and experienced which I'm guessing holds true for the kitchen as well. We ordered a masala dosa, a butter masala dosa, butter Mysore masala, Pao bhaji and sev puri. Which were all good in the same order for me. They need better glassware for fresh juice and water. The decor is quite old but they have kept everything clean which is reassuring. Since people come here to get a quick meal or dates it seemed like, this place could use an upgrade in furniture and decor. Sit upstairs which is less busy and more quiet . 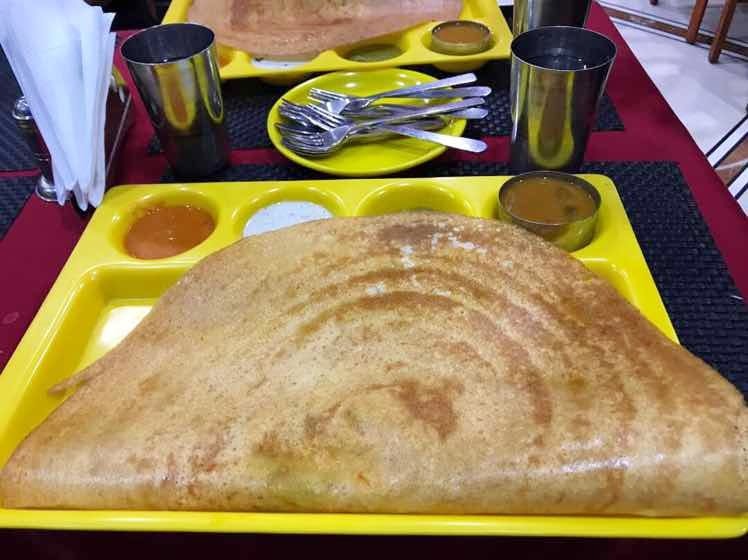 Dosa is a must have.